R2002, Patrick O'Connor. 38", E. Light buff-orange self. Orange spear signal outlined in salmon with a streak extending to the tip of the falls. (Shizuoka Sunrise x False) x Emory Smith. 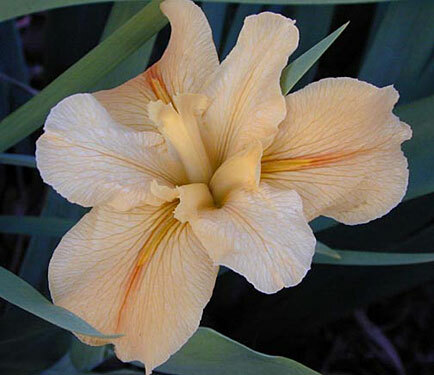 Robust plants with large rhizomes and thick stalks which sometimes produce offsets like a daylily. Interesting color and pattern.